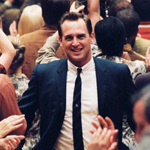 The man who coached that team is a bit of a mystery, even for Josh Lucas, who portrayed coach Don Haskins in the movie. Driving the point home, Lucas added, “Or to put myself into the mindset of the guy I did in Undertow — which is a true story — it plays with your head. The thought of trying to achieve looking like you would hurt your own children, and making an audience believe that....” It was all he needed to say. Undertow had impressed me, as had its director David Gordon Green, who brings an honest, local eye to movies about the South. Born in Arkansas, Lucas had said in other interviews how much he liked the South’s portrayal in Sweet Home Alabama. If you’ve seen both movies, you might be surprised at how different they are. The interview rambled over Jessica Biel, The Poseidon Adventure (Lucas was wearing a cast — he had broken his arm on the set), and the spectrum between fun and work. We ended by talking about Ang Lee, whose Brokeback Mountain had been in the headlines. A different tack from what he experienced with producer Jerry Bruckheimer and director James Gartner?